This WOD was designed by Ben Bergeron for Regional and Open athletes. Ben is the owner and head coach at CrossFit New England and a 2-time Reebok Games competitor. He also coaches the 2015 CrossFit Games champion Katrin Tanja Davidsdottir. 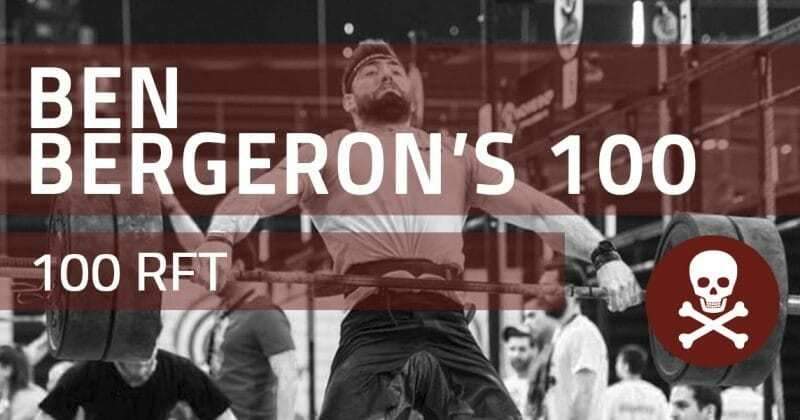 Ben Bergeron’s 100 is a great WOD as a brutal WOD. If you want to do or try a brutal WOD, this is what you looking for! Are you still waiting? Let’s try! This one is one of the greatest WOD for proffesional CrossFit athletes. It’s totally right and great way to begin to your CrossFit adventure. Time is important for this WOD. So record your time. You can see instructions… Be determined and do your WOD. If you want to do Ben Bergeron’s 100 ; The beginning it will be easy but then it will get harder. But you need to push yourself to do your best as you can. This WOD is requires strength, determination, power and passion. If you have all of them, it will great for you. Also you can watch some videos to improve your technique. It’s also great because, its a full body WOD. And please try to continue this WOD session, for as long as you are able. And don’t forget your score. It’s really important to know that, right? And don’t forget this WOD will not kill you. It only will make you stronger than ever. Time it took you to complete 100 rounds.